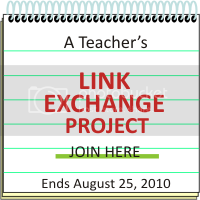 A Teacher’s Link Exchange Project by Ms. Vernz. Basically this project is a solution for those who want to have a number of link exchanges in one sitting. Make a blog post of this project with an anchor text 'A TEACHER’S LINK EXCHANGE PROJECT' linking to this post. You can invite friend bloggers, especially those who have new blogs to join, more posts, more invites, more URLs, more links. Comment on this post saying 'Link Me' and the link of your blog post. Blog URLs submitted not in this format will automatically be deleted. You can submit all your blog URLs at one time submission. Personally, I think this is an awesome idea! As a fellow teacher, I do would like to be connected with others like me. :) Hope to see you all there! thanks for this post.. checking all the links if OK... God Bless.